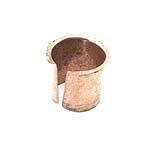 Light rod bushing for the 1928-31 Model A ford. If when you turn your steering wheel, the light switch rod turns, this might be what you are missing. This sets in the tube that the light switch rod goes into and acts as a bushing, and spaces the rod away from the steering wheel. Made in USA. Light switch bracket 1929-31. This bracket bolts to the bottom of the 2-tooth steering column and the light switch body slips into it. Light switch bracket bolts for the 1928-29 Model A Ford. Attaches the light switch bracket to the bottom of the early 7 tooth one piece steering column. Light switch bracket bolts for the 1929-31 Model A Ford. Attaches the light switch bracket to the bottom of the later 2 tooth steering column. 1928-29 Light switch rod Ford style 45-3/4" Long. To obtain the length, measure from the point where the rod meets the underside of the switch plate to the center of the keeper groove just before the bottom end. 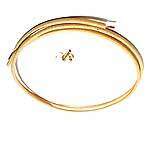 If your original light rod is missing, measure the steering shaft with a piece of string or wire. This light switch rod is for a 44-1/2" shaft. 1929 Light switch rod Gemmer style 45" Long. This light switch rod is for a 43" shaft. 1930 Light switch rod Ford Style 45-3/4" Long. 1930 Light switch rod Gemmer Style 44-31/32" Long. 1930-31 Light switch rod Gemmer Style 45-31/32" Long. This light switch rod is for a 44" shaft. Horn rod repair kit for the 1928-31 Model A Ford. The wires, contacts and insulators you will need to repair, the guts of the light switch rod. Made in USA. Horn rod repair kit for the 1928-31 Model A Ford. New wire and fittings with instructions to replace broken wire inside horn light rod. This full kit includes the large plastic spacer under the horn button (not in some other kits). Horn button & escutcheon for the 1928-29 Model A Ford. 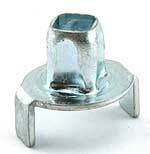 The chrome button, escutcheon, spring and spring base only to repair an original light switch rod assembly. If you are ordering a new light rod, this will already be installed. Horn button & escutcheon for the 1930-31 Model A Ford. 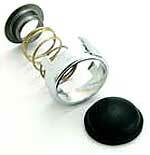 The black button, escutcheon, spring and spring base only to repair an original light switch rod assembly. If you are ordering a new light rod, this will already be installed. Light switch Spring for the 1928-39 Fords. This is the spring that holds tension against the spider to hold the light switch rod in place. Made in USA. Light switch spider for the 1928-39 Fords. This is the part that fits the square part of the light rod at the bottom of the steering box and operates the light switch. Light switch spider retainer for the 1928-36 Fords. The small U shaped retainer that holds the spider on the rod. Better order an extra one since they are small and easily lost. This tool slips around the ears of the light switch spider and gives you a large surface to push on so you can compress the spring to install the retainer. Made in USA.